The Rangeview Library District of Colorado marked the grand opening of its new Anythink Huron Street Library with a wide-ranging ceremony with prominent speakers, an adult story time and Manick Sorcar's Laser Light Magic. It was attended by a number of dignitaries which included U.S. Representative Jared Polis, Adams-County Commissioners Skip Fischer and Larry Pace, State Sen. Lois Tochtrop, State Rep. John Soper and area mayors. The event's theme, "A Celebration of Light" was inspired by the design of the 25,000 sq. ft. building that contained the new library. "Anythink is a place where you can find more than just books," said Rangeview Library District Director Pam Sandlian Smith, "you can play video games, download audio books right to your ipod, read quietly by a fireplace, or interact with information - not just be a passive recipient of it". The ribbon-cutting ceremony took place at 1 pm followed by event ceremonies which were open to public estimated to be over 2000 visitors. (Left) A scene from Manick Sorcar's "Imagination". 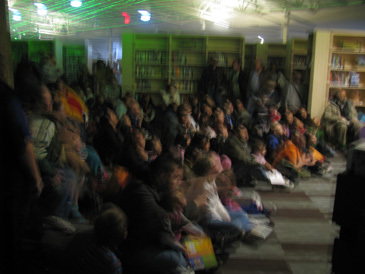 (Right) A part of the audience during one of the three shows. Many secured their seats on floor and remained there to watch three times. 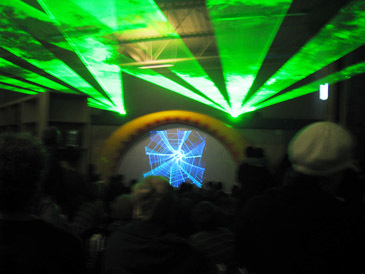 Two days earlier, regarding Manick Sorcar's participation at the great event, Northglenn-Thornton Sentinel reported on February 4, 2010, page 3A: "The ceremony will be capped by a series of laser light shows, beginning at 4:45 pm. Internationally known laser light artist Manick Sorcar will perform by the entrance to the children's area and repeat the show every half-hour until 6 pm. Sorcar's artwork also will be on display in the community room". As a part of the interview, Sentinel quoted Sorcar's statement regarding his contribution through the show "A library is where kids come to learn and get a wealth of information. They can read about art, lighting and Laser. What I am offering is all of that put together and experienced in front of their eyes. Laser is the cutting-edge technology of light, and people of all ages can witness how a narrow beam of light can be used as a paintbrush for graphics and animation". 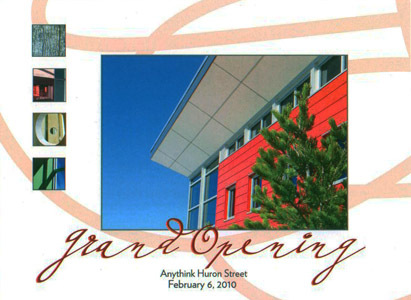 Manick's animation "Imagination" was custom designed for the Grand Opening of Anythink's library. It started with a doodle drawn by a child that transformed into a variety of scenes and events - starting from the bottom of the ocean to the endless space in the galaxy- all through the child's imagination. The show was repeated three times, each to the thrill of a packed audience. Many secured their seats and remained there to watch it all three times. "I knew your shows are good, but never imagined they would be this good", said Rangeview Library District Director Pam Sandlian Smith to Sorcar after the show, "Congratulations! Thank you so much for sharing it with our library!"